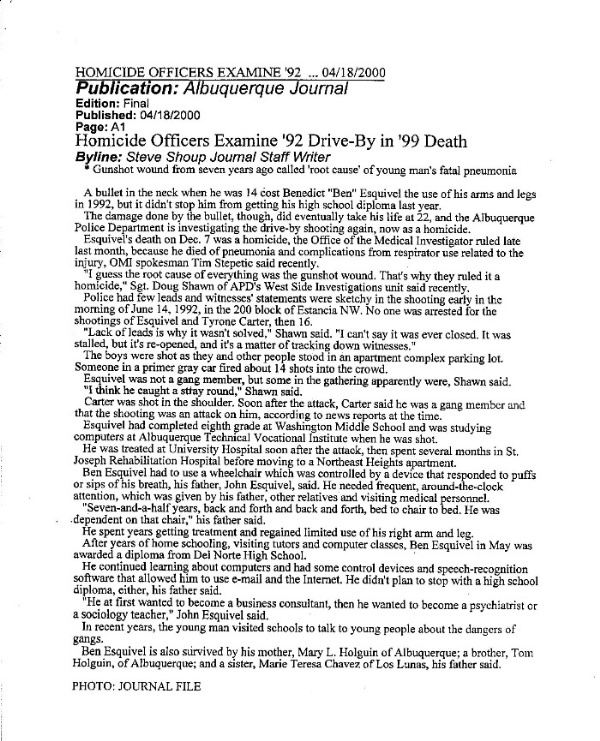 My son, Benedict Esquivel, 14, was the victim of a gang-related shooting in Albuquerque, NM, on June 14, 1992. Benny was shot behind the ear with a .22 and survived seven and a half years as a quadriplegic until his death on December 7, 1999. Because he died of pneumonia and complications from respirator use related to his injury, the Officer of the Medical Investigator ruled his death a homicide. The shooting occurred on the 200 block of Estancia Drive NW. , outside an apartment complex where one of Benny's friends lived. 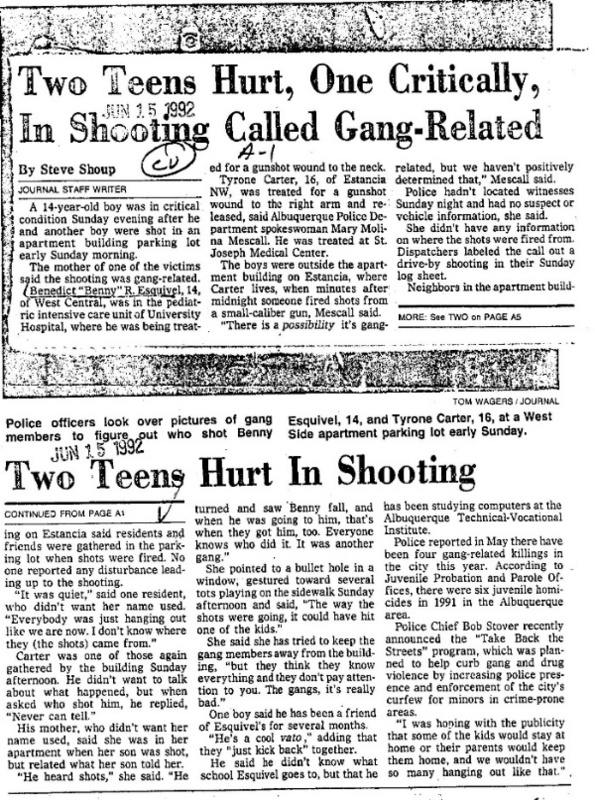 That friend, Tyrone Carter, 16, was shot in his right arm with a 25 caliber. Benny was not a gang member, but Tyrone was, and told police that he was the intended victim of a rival gang. There were plenty of witnesses to the shooting who were able to describe the car the shots were fired from. Tyrone's mother told reporters, "Everybody knows who did it." The police drove me to the hospital. They dropped me off and said they would come back later and take a statement. Instead, the Gang Unit phoned me at the hospital and told me they wanted me to drive out to the precinct on the west side of town to talk to them. I told them my son was still unconscious and I didn't want to leave him and asked them, please, to come to the hospital to take the statement like they'd said they would. They refused to do that. They didn't want to have to drive all the way across town. The next day two girls came to the hospital and told me all about the shooting. They told me it was a gang initiation and gave me the name of the gang, who were known as "The Happy Homer Wannabe's" and the nicknames and descriptions of the guys who did the shooting. Apparently they were out to get Tyrone, and Benny was an accident. I recognized the name of the gang, because they holed up in motel across the street. The girls said the two guys who shot Benny and Tyrone were called Ace and Droopy. They described Ace as heavy set, bearded, and always wore glasses and a topcoat. They said Droopy was skinny with a scar down his chest and had tattoos. Since the Gang Squad wouldn't come to the hospital, I phoned Det. Ron Merriman, a cop I knew from when he and his partner would come into the High Noon restaurant where I used to work. I asked him to come to the hospital and take my statement, and he did. He told me he hand-delivered my statement to the Gang Squad, so I assumed the information was being followed up on. Turns out, it wasn't. The police now say Det. Merriman never gave it to them. No investigation was ever done on my son's case. After Benny was improved enough to be in rehab, I tried to get hold of Det. Merriman again to find out what was going on, but there was always an excuse why I couldn't talk to him. Then APD said Merriman retired and moved to Queens, New York, and they couldn't give me an address for him because then, if something happened to him, it would be my fault. 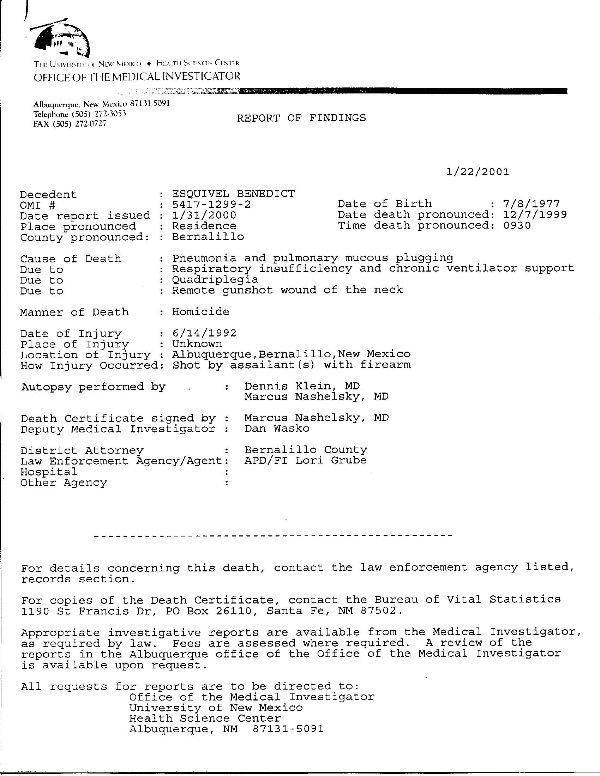 I've since learned, from the mother of another homicide victim, that Merriman was still living in Albuquerque at that time and probably still lives there now. I know it's the same cop, because this woman described him as a light skinned colored guy, which is the same Det. Merriman who took my statement. I don't know why the police would tell me he'd moved to New York. 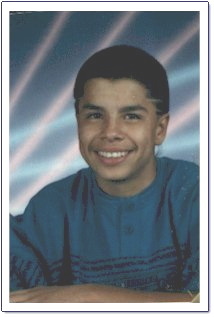 Benny was shot late on a Friday night, and a TV show about gangs was being filmed in Albuquerque on that same weekend. That film featured members of the same gang the girls said shot Benny and showed how they recruited members and did shootings. 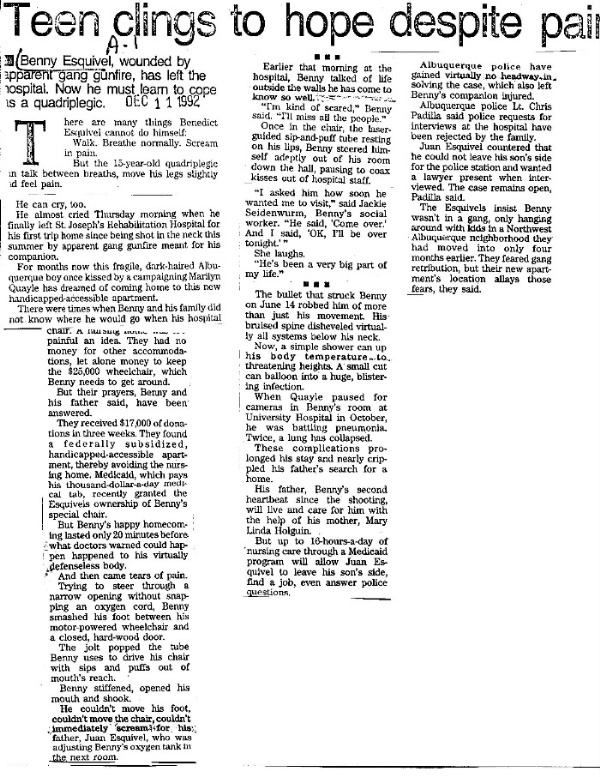 On a scene from that show that was filmed the day after Benny was shot, members of that gang were shown with a machine gun at a rifle range, and they yelled out, "We killed somebody on Estancia Street last night!" (They didn't yet know that Benny had come out of his coma and hadn't died the way everybody thought he would.) Knowing who those guys were, I considered that a confession. I got a copy of that tape and gave it to the D.A., Bob Schwartz, and asked him to have those gang members brought in and questioned, but he said there wasn't enough evidence to do that. I tried to get more information about that TV statement, but the police said I couldn't have it because it was privileged information with the press. The seven and a half years between the time of the shooting and Benny's death were hell for my son, but he was a trooper. He had to use a wheel chair, which was controlled by a device that responded to puffs or sips of his breath. He needed round-the-clock attention. I was Ben's primary caregiver. His Aunt, which was also his nina; Benny's mother; his brother and sister and other relatives, spelled each other taking care of him. He couldn't be left alone for more than 20 minutes. Seven and a half years, back and forth, back and forth, bed to chair to bed to chair. He spent years in therapy and eventually regained limited use of his right arm and leg, but his bruised spine wrecked all systems below his neck, so a shower could dangerously shove up his blood temperature, and a little cut could balloon into a giant blistering infection. Even so, thanks to years of home schooling, visiting tutors and computer classes, he received a high school diploma. And he didn't plan to stop there. He wanted to become a psychiatrist or a sociology teacher. And he visited schools to talk to kids about the dangers of gangs, drugs, alcohol, smoking, etc. One day when I had Benny at the hospital for treatment, we ended up in the same elevator with Ace. He was there visiting somebody on the fifth floor. Benny said to me, "Dad, that's the guy who shot me!" Ace shoved his way past Benny's wheel chair and bolted out of the elevator. I went straight to the receptionist and told the guards, and they sealed off the area, but it was too late. Ace had already disappeared. 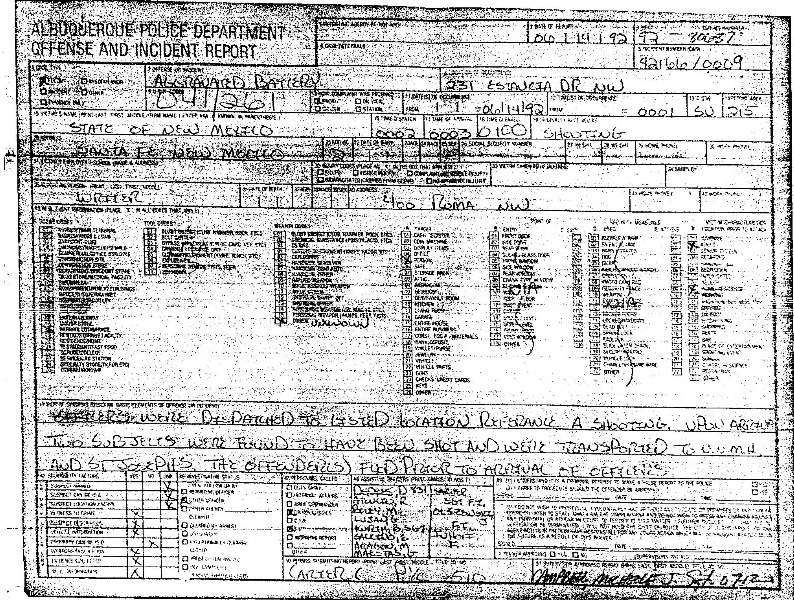 After Benny died, a reporter asked the police if they were going to investigate the case now that it was labeled a homicide. APD Sgt. Doug Shawn told the press, yes, they were going to reopen it and would start tracking down witnesses. But they didn't do anything. I tried to talk to the case detective, but she had been transferred, and I was referred to another detective. He kept saying, "I'll get back to you, I'll get back to you, I'll get back to you." Finally, one day, he said, "The case is too old. We can't investigate it now." I don't know why they can't investigate it now. It's not like they don't know where Ace and Droopy are - they're both in prison for shooting other people. And there's a witness, a member of the 18th Street Gang, who is also in prison, and knows all about the shooting and can nail Benny's killers if the cops would ever really grill him. The D.A. says to me, "Since Benny's killers are already incarcerated for another crime, it doesn't make any difference if they're not charged with Benny's murder." The other crime they are incarcerated for is also murder. It may not make any difference to the cops and D.A., but as Benny's father, it makes a difference to me and to the other members of Benny's family who loved him. His murder was a great loss. We are all still, and will forever mourn not only his death, but also the life which was so callously stolen from him.